Queen Margaret University is Scotland's smallest university with internationally recognised research and teaching activities. The University has over 4500 students, including around 1000 international students from more than 65 countries. Since its inception, QMU has made a crucial and distinctive contribution to education by focussing its expertise on issues of pressing social need whilst at the same time offering teaching research opportunities that are inter-professional, inter-disciplinary, industry-relevant and international in outlook. Courses at QMU cover many specialisations within health care, business and management, social sciences, drama and creative industries, reflecting the vocational and professional emphasis of the institution. The University's small size means that it can offer a friendly and supportive environment for its students. There are lots of reasons to study at Queen Margaret University - from our friendly and supportive staff, to our new purpose-built campus with sports facilities and our Learning Resource Centre which hosts a range of excellent facilities to help your learning. And we have an enviable 93% graduate employment rate. Our recent graduates can tell you for themselves why they chose QMU. What's more, we have recently been ranked 1st the in the UK for Overall Living Experience and for International Student Support in the sector-wide Student Barometer survey. 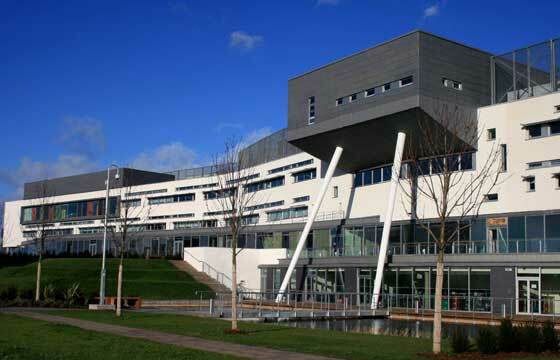 QMU is located on the southeast side of Edinburgh, Scotland's beautiful capital city. The University moved to a new purpose built campus in 2007 housing a vibrant academic village with innovative learning spaces, attractive landscaped spaces and excellent transport links to the city centre, including a train link which takes just 7 minutes to reach the city centre. The new campus includes student residences, a student union building, indoor sports facilities and all weather surfaces, a variety of catering outlets, a shop and landscaped gardens with a range of environmental features. The design takes full account of the needs of today's students. Current students have been consulted throughout the relocation project, from involvement in the choice of site and input into the design of buildings, to decisions on the types of catering facilities on campus. There is appropriate disabled access to residences and academic buildings. The University is pleased to offer up to 15 competitive scholarships of 2000 pounds each for new international students undertaking their first year of study on an undergraduate or postgraduate degree. The scholarship is granted as a reduction of the tuition fee and is available to students who are self-funding with an international tuition fee of more than 8000 pounds for a single year of study only. The University is also able to offer a small number of scholarships to students from India as part of Scotland's Saltire Scholarships. These awards are jointly funded by Queen Margaret University and the Scottish Government, inconjunction with Education UK Scotland. Awards worth 2000 pounds each are available for Indian students studying on full time masters programmes at QMU. The scholarships are granted as a reduction of the tuition fee payable by the student.